Should I Feel Good About Being Overweight? I’m feeling happy this morning. 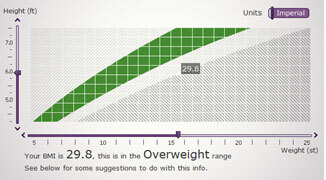 With my weight now dropped to around 15.5 stone (98 KG) my BMI has come down just to the “overweight” upper threshold. When I started out on my Killimattjaro project I was over 17.5 stone (111KG) which was clinically Obese – so it’s nice to see some progress. That said in reality nobody should be content to be overweight and I do want to get more weight off before June. With my gym work and being reasonably disciplined in my diet I’m sure there are more gains (losses?) to be had. Keep going Matt! Need you at 86Kg if there’s any chance of success! I will Howard, cheers! I’m getting regular gym sessions in and will be out for a hike this Sunday. I’d be happy to get down to around 14 stone (89KG) but cardio fitness and lots of walking are the key things I need. The rest will be sheer determination and coping with the effects of altitude (which there is little you can do beforehand). I’m not of a mind to quit, I have every intention to make it to the summit and back!